The internet has exploded with the warm and fuzzies after a Kansas teen asked a girl with Down syndrome to be his prom date – in the sweetest way. Shaedon Wedel’s prom – the American version of a matric farewell – is coming up. He’s known Carlie, a girl with Down syndrome, for years because he’s good friends with her brother, BuzzFeed News reports. Apparently, Carlie really wanted to go to prom because her brother and his girlfriend are going. So Shaedon decided the best possible solution was to take her as his date. 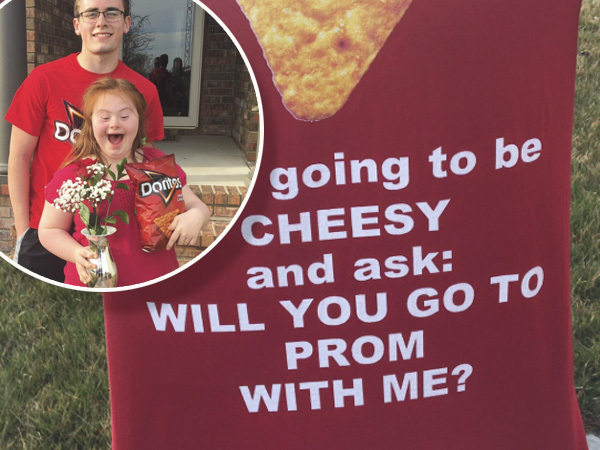 He had a T-shirt printed with the words: “I know I’m NACHO typical Dorito, but I’m going to be cheesy and ask, ‘Will you go to prom with me?’ ” Doritos are Carlie’s favourite snack. As part of the proposal, he presented Carlie with a bouquet of flowers and a packet of Doritos. “In order to make her prom as special as possible, I decided to go all out from the beginning,” he told BuzzFeed News. And judging by Carlie’s reaction, she clearly also loves Shaedon’s bright idea!